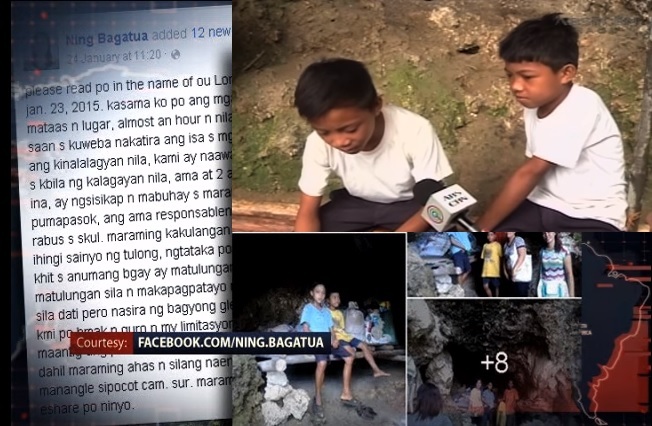 MANILA, Philippines - Two young brothers living in a cave in Camarines Sur have earned praises from netizens after their inspiring story was shared on Facebook by their teacher. Jayson and Juan Garaña Jr. are grade school pupils at Manangle Elementary School in Sipocot, Camarines Sur. But unlike other regular students, the Garaña brothers had to endure a long walk towards their “home” at the peak of a hill. Unknown to many, these young boys live inside a cave with their father. According to a report by ABS-CBN News, the family had no choice but to find refuge in the cave when their small hut was devastated by the typhoon Glenda in 2014. A small lamp lights their unusual home which has a small bedroom, a cooking area and a dining table. Most youngsters entertain themselves at home using TV or gadgets, but the two actually spend their free time playing an old-school Pinoy game, holen or marbles. Their teacher, Luningning Bagatua, discovered the boys’ condition during a home visitation last January 23. Although Bagatua and her co-teachers initially took pity of the brothers, they couldn’t help but admire the boys. “Masigasig po silang mag-aral kasi alam ko po malayo ang lugar nila pero araw-araw po sila pumapasok maliban na lamang po kung may sakit,” Bagatua told ABS-CBN News. Because of Bagatua’s viral post, which has earned over 16,000 shares as of this writing, several good samaritans pledged to help the brothers. In fact, someone has agreed to sponsor the snacks of the boys. The two boys, who aspire to become soldiers someday, would like to live in a more comfortable shelter in the future.